Style and functionality designed for outdoor enthusiasts to the trendy urbanites. 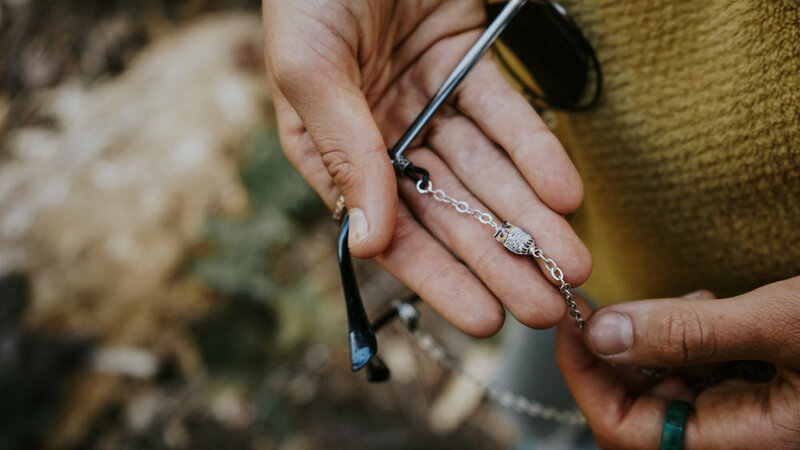 Using precious stones, fine silks and top tier materials Bound Eyeglass Lanyards creates a stylish assurance for the safety of your glasses. We teamed up with Bound to tell their story. We believe that through developing a strongly defined culture a product's appeal will sell itself. Lanyards always in focus with natural muted tones secondary in the background. Eyes never in the shot because the focus is the product not the model. We recognized how the natural text of the logo organically simulates a pair of glasses. We enhanced and stylized that natural simulation to fit within a half circle to enhance the sense of unity a lanyard provides. Bounds direct function and responsibility is to fasten and protect you glasses in a fashionable manner. Style, sophistication and artistically crafted. We're excited to collaborate with you!